My husband brought this awesome lamp home the other day. A former co-worker had left for a new job and abandoned it. Once he got it home we discovered WHY it had been abandoned. It doesn’t work. Bummer. Instead of junking it I put my thinking cap on to figure out a way to make use of it. Like the Real Estate agents say “it has good bones”. I love houseplants but I have cats who love to eat my houseplants. I’ve tried placing my plants on raised surfaces but my cats are wily and spry. They have the ability to jump and leap onto high surfaces nibble my plants and knock them over spilling dirt all over the floor. Usually, right after I’ve mopped. How do I curb this problem? By turning that old broken lamp into a plant stand that’s how! The tiered shelves on the lamp are the perfect surface to place houseplants while keeping my cats at bay. I cut the electrical cord off the bottom of the lamp and removed the light bulb from the top. By placing a ceramic saucer over the spot where the light bulb was the top of the lamp becomes the perfect planter for a spider plant! Now that planting season is over you can find great planters on the cheap! All of my planters were found on clearance and purchased for only a few dollars each. This Tea cup planter was found at Jo-ann’s on Clearance for $2! I altered it with an image from the Stamping Boutique (our sponsor at the Altered Alice this month). The image was colored with Copic Markers and sealed with Mod Podge clear sealer. Yes it’s true…Mod Podge now comes in a spray can! Does it get any better? I used regular Mod Podge to mount and seal the image to the Tea Cup Planter. *When Mod Podgeing an image to a rounded surface you will need to cut slits all the way around to allow the image to overlap. I gave the Tea Cup a light coat of Krylon Glitterblast (Diamond Dust) to finish it off. I’ve finally jumped on the succulent band wagon. I’ve seen so many beautiful Succulent planters on Pinterest I wanted to try one out for myself. The succulent looked a little lonely and bored in the tea-cup planter all by its lonesome. I thought I could liven it up a bit by adding some of my paper flowers. These flowers were created with a variety of Sizzix Flower dies. You can’t go wrong with the Tim Holtz Tattered Florals Die or pretty much any die from the Flower Layers Collection. If you are looking for a simpler way to create paper flowers I have a tutorial on making paper flowers with punches. Our theme at the Altered Alice this month is “How Does Your garden Grow?” I searched for whimsical planters that would give my plant stand a whimsical, Wonderland feel. I love how the Spider Plant looks draped over the lamp base. For the top-tier I placed a Christmas Cactus in a $2 planter from the Christmas tree shop. I chose this planter because it looks like a vintage tea-cup. Of course the Alice in Wonderland Tea Cup Planter actually IS a tea-cup. Next, I found this Tea Pot Planter (also at Christmas Tree Shop). There was a small chip in the spout so I got it for $5! I don’t think I could have achieved a more wonderland styled look unless I had found the Cheshire cat himself on sale! I never thought to combine my paper flowers with real live foliage. What do you think of this look? I can’t wait to try out more succulent arrangements. Succulents are so easy to care for and just lovely to look at. I suppose I will need to keep my eyes peeled for another broken lamp to turn into a plant stand. How do you display your plants? Have any creative ideas on how to keep plant nibbling cats away? I’d love to hear about it. I hope you will join us for our garden party at the Altered Alice this month…you can read all about our sponsor below. The winner will receive 3 digi images from The Stamping Boutique, which has a wonderful Alice in Wonderland line w! 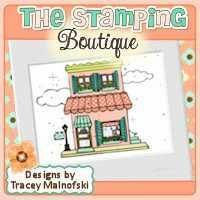 Tracey Malnoski is the owner and illustrator, and she has previously designed stamps for Unity, InStyle, Squigglefly, and The Digi Shack. Her Stamping Boutique has it all: digital images, red rubber stamps, and themes that include fairytale, whimsy, sentimental, and candy. Please visit theStore and their wonderful Challenge Blog! Yes, plants have to stay outside, as our cats eat most anything. They’d definitely eat your lovely paper flowers too, if they were reachable somehow. (Our cat Lulu knows no fear, so she’s able to get to just about anywhere – or onto anyTHING – that she wants to.) That being said, you my dear are super creative! how clever is this??? love the paper and live flowers and plants! oohh WOW !!. Never thought of combining live & paper plants either, but you made it looks soooo harmoniously living together. Great move, Amy!. I LOVE all the cascading plants. Yeah, I don’t have many plants either at home, my cats get into trouble ALL the time. Just last night, one of the fattest cat missed his jump, LOL. Is that a good indication to keep indoor plants back in?. I have a fat cat too who misses jumps on a daily basis. I haven’t the heart to tell her she will never be a contender in the Kitty olympics.